Lincoln Corporation purchased the very first production Leyland Titan in 1927 (TD1 Chassis No 70001) and continued to buy Titans until 1968 (the last were forward entrance PD2/37 models). After 1941 all Lincoln's Titans were bodied by Charles H Roe of Leeds, No. 89 being one of a batch of four delivered in 1961, in a non standard colour scheme using a Leeds City Transport green and a deep cream - it is still uncertain whether this was an experimental livery, or a misunderstanding at the Roe works. 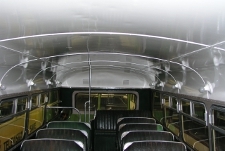 This batch returned to the traditional 'exposed radiator' after the 1957 batch with 'tin front' styling. 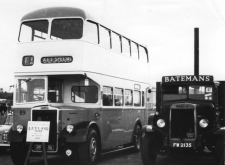 This vehicle represents the later stages of development of the Leyland Titan chassis, with a larger 9.8 litre engine and part synchromesh gearbox, although it has the traditional vacuum brakes, and is 7'6" wide - most models being built by this time were 8' wide. No. 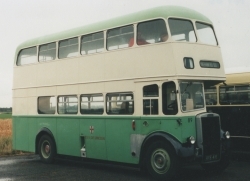 89 when new, on display at the 1961 Skellingthorpe Carnival. No. 89 in service with Lincoln Corporation - depot yard, mid 70s - showing the 1975 livery (LVVS Collection) No. 89 in preservation, in the 'Leeds' green livery . Withdrawn in 1977, when No. 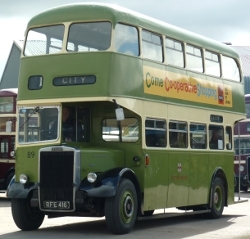 89 was the last rear platform bus in service with Lincoln Corporation, it was quickly purchased for preservation and after initial restoration back to its original 'wrong' livery, it now carries the livery style introduced in 1963. In 2003, No. 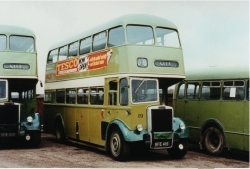 89 (along with our other two Lincoln Corporation double deckers) received traditional advertisements - including one for the Society, matching an advert carried in later years by one of the PD2s. 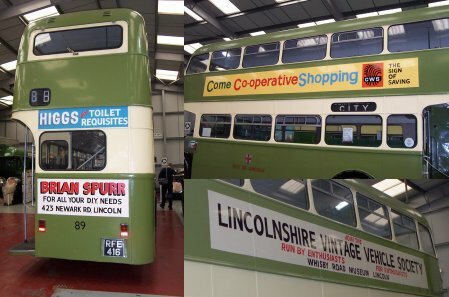 The advert above the rear window is a Lincoln Corporation tradition - for some considerable time all Lincoln Corporation buses carried Higgs Bros adverts, such as Higgs for Cigs, Higgs for Leather Goods, Higgs for Haircutting etc - Society founder Vincent LeTall being of the Lincolnshire firm. April 2011 - New head gaskets have been fitted and the upper deck is receiving attention from the paintbrush. October 2012 - New batteries and two new tyres have been fitted. July 2013 - Overhauled injectors have now been fitted, together with replacement rocker gear in the hope of reducing a rather noisy engine. January 2014 - Lincoln 89 has now received a `new` 0600 engine - a big story here! - the engine coming from a former Stockport PD3 /14 which was scrapped in 1983. April 2015 - The cab is receiving refurbishment, which is long overdue!